How Big Do Eels Get? About 600 species of eels are grouped into 19 different families. They range in size from only a few inches long to over 12 feet in length. Eels weigh, on average, around 30 pounds. But size, length and weight vary based on species and gender. The most common kind of eel is the moray eel. Most male moray eels (Gymnothorax polyuranodon) grow to about 18 inches long, while the females grow to 3 to 4 feet. Whether an eel grows quickly or slowly depends on the environment in which they live. Eels who live in freshwater streams are slower-growing than eels who live in estuaries. Some of the world's biggest eels live in New Zealand, the largest weighing around 88 pounds. These longfin eels (Anguilla dieffenbachii) grow slowly compared with other fish. They usually grow around a half-inch to an inch each year, but they have long life spans. Some of the large eels in the region have been estimated at 60 years old or more. 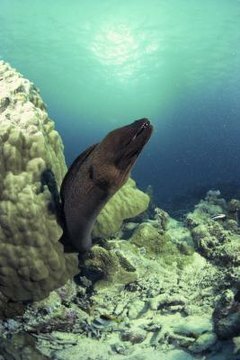 Interestingly, the largest eels are often females who were slow to reach sexual maturity and have not yet made it out to sea where they can mate. Besides the morays, three other main eel types exist: American eels (Anguilla rostrata), European eels and conger eels. American eels are 1 foot to 6 feet long, depending on gender. European eels can grow to length of up to 5 feet. The biggest observed conger eels have been around 10 feet long. Moray eels are usually 4 to 5 feet long. Some of the rarest and endangered eels are not so different from common species of eels like the moray. The Malabar swamp eel (Monopterus fossorius) grows to be about 9 inches long. The major threat to the Malabar swamp eel is the disappearance of the creature's natural habitat. Likewise, the blind eel swamp, which grows to lengths of up to 12 inches long, is endangered because of human water pollution.